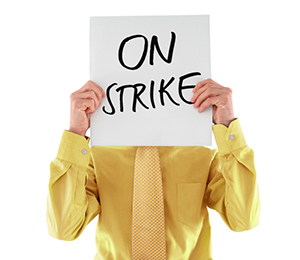 Help – my staff are striking! What should you do if your employees engage in unprotected industrial action? In the current economic landscape, corporate restructures and redundancies are inevitable, as is the threat of industrial action from disgruntled employees. HR professionals can help their organisations weather the storm of industrial action by being well-prepared and sticking to a strike strategy, says Kathy Dalton, Partner at law firm DLA Piper. “In terms of best HR practice there is no substitute for early and careful preparation for such an event,” Dalton told HC Online. “It is important to develop and implement a clear strategy, supported by a strong communication/media plan both with employees and the union,” she says. Dalton says unlawful strike action often catches employers off-guard and results in costly consequences. “Unprotected industrial action can be hard to stop,” Dalton says. “Often it is taken as short, sporadic, unpredictable wild cat, action which causes short term damage, inconvenience and reputational risk for an employer but it is difficult to take action against because it is like fighting spot fires,” she says. Dalton says HR professionals and employers must follow several key steps when their staff engages in unprotected industrial action. “The first thing employers should do is write directly to their employees putting them on notice that the industrial action is unprotected and what the consequences of that may be for the employee,” she says. Dalton says employers may also apply to the Fair Work Commission seeking an order to stop the unprotected industrial action when it is already occurring, or to prevent the unprotected industrial action from occurring when it is threatened or impending. “The Fair Work Commission can make this order on its own initiative, or upon application by either a person affected by the industrial action or an organisation representing that person,” Dalton says. “Where the Fair Work Commission has issued an order to stop or prevent unprotected industrial action, it is unlawful for that industrial action to occur or continue in contravention of the order,” she says. Individuals who breach an order made by the Fair Work Commission can be hit with penalties of up to $10,800, while corporations could face up to $54,000. Employers can also seek an injunction to stop the industrial action continuing as well as report the conduct to the Fair Work Ombudsman who may investigate and potentially prosecute. Dalton says employers may be able to seek compensation for any losses incurred by striking employees, particularly if the unprotected industrial action caused financial harm to the company. Unprotected industrial action can be extremely damaging and inconvenient to employers, Dalton says, so it is imperative that HR professionals are well-equipped to manage industrial disputes.